Moss for breakfast? That's Iceland! Moss for breakfast? That’s Iceland! Home Foodie Corner Moss for breakfast? That’s Iceland! Have you ever wondered what a typical Icelandic breakfast looks like? What’s the first thing sleepy Icelanders think about when they walk into their kitchens early in the morning? Let’s have a look at breakfast habits in Iceland. *This is a sponsored post that we worked on with Herbalife – but as always the views in it are 100% our own. We won’t beat around the bush – we simply love to eat. For us, one of the most enjoyable ways to experience a certain place is through its food. Before we came to Iceland we wondered how Icelanders start their day. What do they think about when they walk around their kitchens, still half-asleep. What do they take out of their fridges and cupboards during the gloomy mornings? As you probably know, culinary traditions in Iceland can be quite surprising. Boiled sheeps head (svið), smelly Christmas fish – skate (skata), blood sausage with rice pudding, cinnamon and sugar (slátur), and so on. Fortunately, the breakfast menu seems to be more merciful to those who don’t like such extravagant food experiments. So don’t worry. Icelandic breakfasts are far from controversial although you can still find some intriguing components. Because of the harsh climate, an Icelandic breakfast should be fairly calorific and very nutritious. It’s been that way since the old days. In Iceland, it’s unusual to run out of the house with just a couple of sips of coffee and a croissant. After all, breakfast is the most important meal of the day. Before we move on to Icelandic breakfast dishes, we’ll tell you which morning habit surprised us the most. Although we did say there wasn’t going to be anything controversial or unusual here – there is an exception. Some Icelanders say that if you wake up with an upset stomach, you should have a bite of fermented shark (hákarl). It turns out that for Icelanders hákarl is not only a fantastic snack that perfectly matches brennivín, Icelandic cumin vodka. They say that hákarl is the only thing which can cure an upset stomach fast. Fortunately, we haven’t had any stomach problems in Iceland. But we have tried the shark and to be honest, it’s one of the most disgusting things we’ve ever eaten! Let’s get back to more pleasant topics – typical Icelandic breakfast ingredients. Oatmeal has been eaten on the island for a very long time. 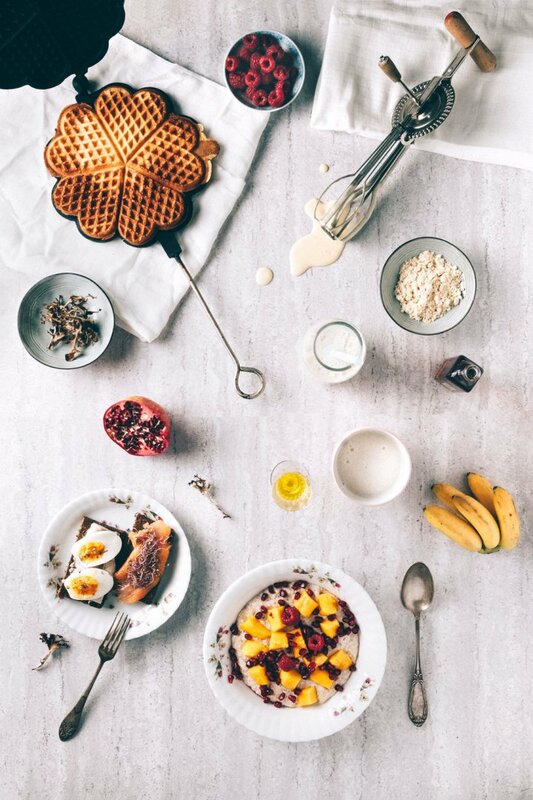 Many Icelanders just can’t imagine a day without a bowl of healthy oatmeal (hafragrautur). Maybe as a child, you were forced to eat oatmeal and now you can’t even look at it. If you still flinch at the thought of having this for breakfast, we can assure you that Icelandic oatmeal is very tasty. The idea of preparing hafragrautur has changed much through centuries. The most important change has happened in the last ten years when many people started to add new ingredients to their healthy morning bowls. You have to agree that in the past oatmeal was quite boring and not so tasty. It was just a mix of oatmeal with water and a bit of milk. Now it is eaten with fruits, nuts, chocolate and different kinds of syrup. A long time ago such treats were not commonly available on the island. Years ago even if people had had them to hand, they wouldn’t have had such a wild idea to add pieces of chocolate to hafragrautur. 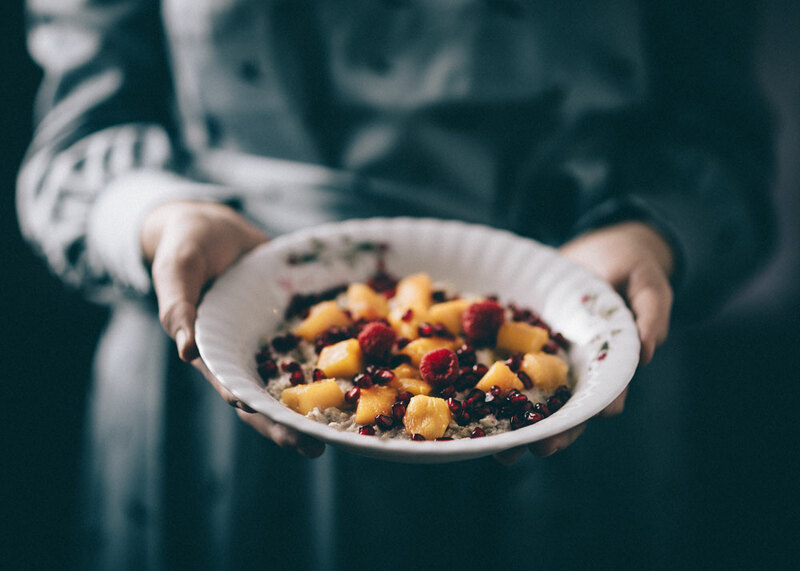 The culinary tradition evolved slowly in Iceland so the delicious flavours associated with oatmeal came about much later. We love oatmeal with different fresh fruits. 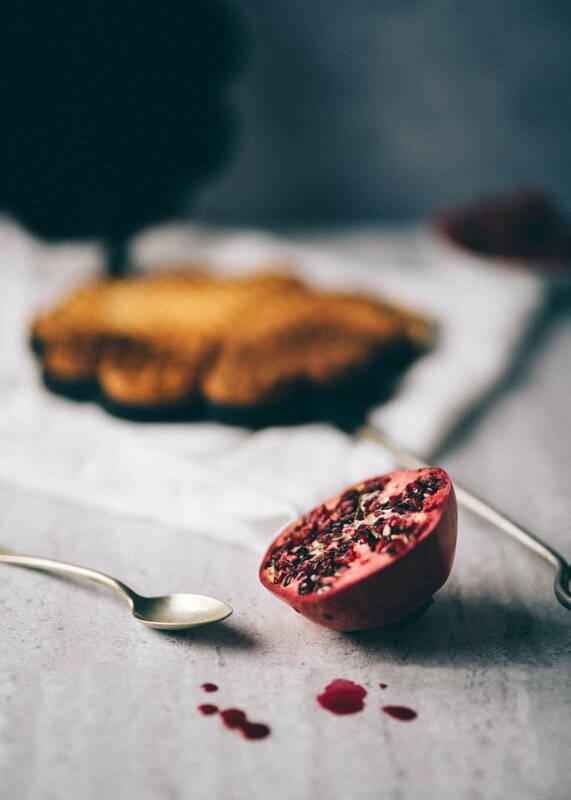 One of our favourites in the winter is hafragrautur with pieces of mango, pomegranate and arctic angelica syrup. 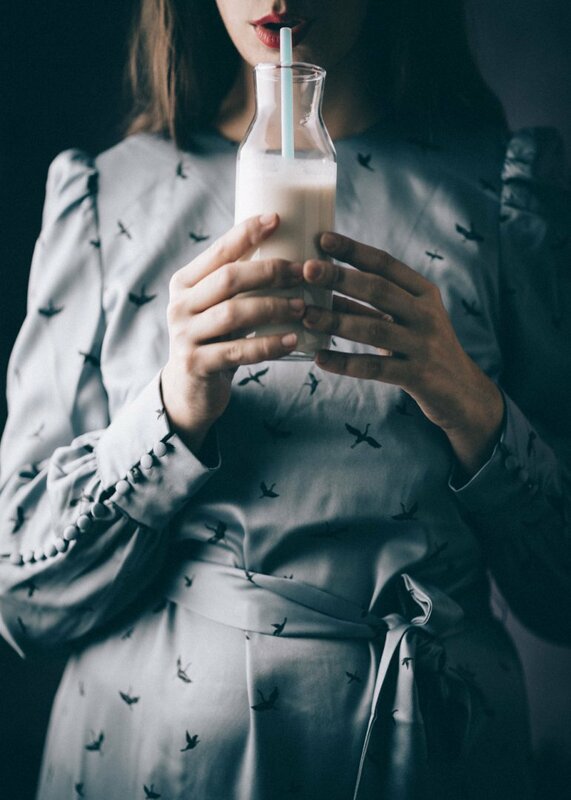 Icelanders can’t imagine their morning without skyr. Skyr is a traditional Icelandic dairy product similar to thick yoghurt. In Iceland, people have enjoyed eating skyr for more than a thousand years. Nowadays it hasn’t lost its popularity. No wonder the whole nation loves it. Skyr is considered to be the healthiest dairy product available on the island and is really tasty and filling. It is also a great source of proteins and carbohydrates. What’s more, it contains only 0.5% fat. There are many flavours. If you want to have it with some fruits, it’s best to choose a natural flavour. Icelanders usually add a bit of milk, some fruits or a big spoon of their favourite marmalade. 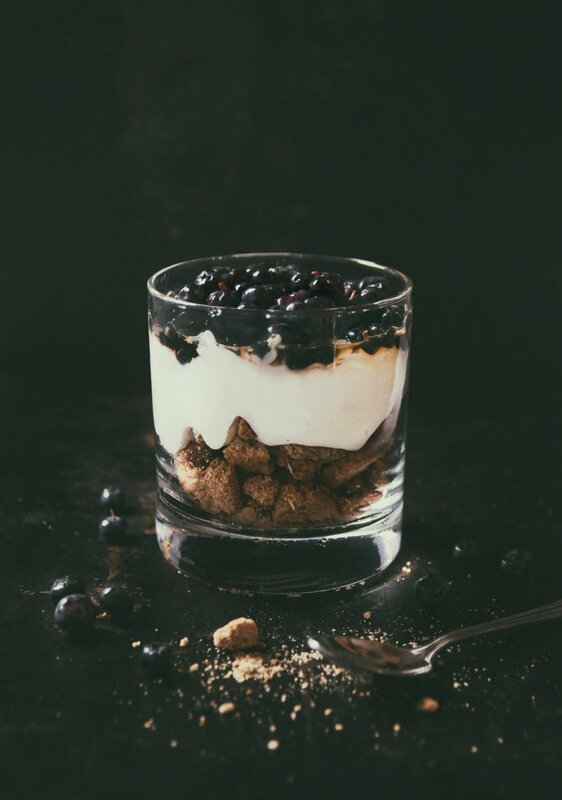 When we are in Iceland, we love to eat skyr with handpicked blueberries and a few drops of birch syrup. If you are still a bit hungry, just have a few more spoons of skyr. Then you can start your day full of energy. Breakfast without a proper dose of cod liver oil (lýsi)? Many Icelanders just couldn’t imagine it. For a long time, cod liver oil has been thought to boost the immune system, helping with vigour and improved concentration. Icelanders joke that without it the entire nation would hibernate during the wintertime. Although lýsi is available also in pills, most Icelanders still prefer to drink liquid lýsi. Its aroma is quite strong and distinct but you get used to it. We have also included it in our diet. Our breakfast always ends with a spoon of lýsi. Like in many other countries, eating sandwiches for breakfast is also very popular in Iceland. Everything that you put on a slice of bread is called álegg. One of the Icelandic sandwiches is quite special. We’ve never seen such a combination anywhere else. The most important ingredient is obviously bread. Rúgbrauð is a dark, a bit damp and slightly sweet rye bread. Originally it was baked underground on geothermal areas for around 24 hours (it used to be called volcano or geyser bread). Now many people make it at home in regular ovens, and you can also get it in supermarkets. But in some parts of Iceland, people still bake their bread in the traditional way and you can try it in many places around the island. 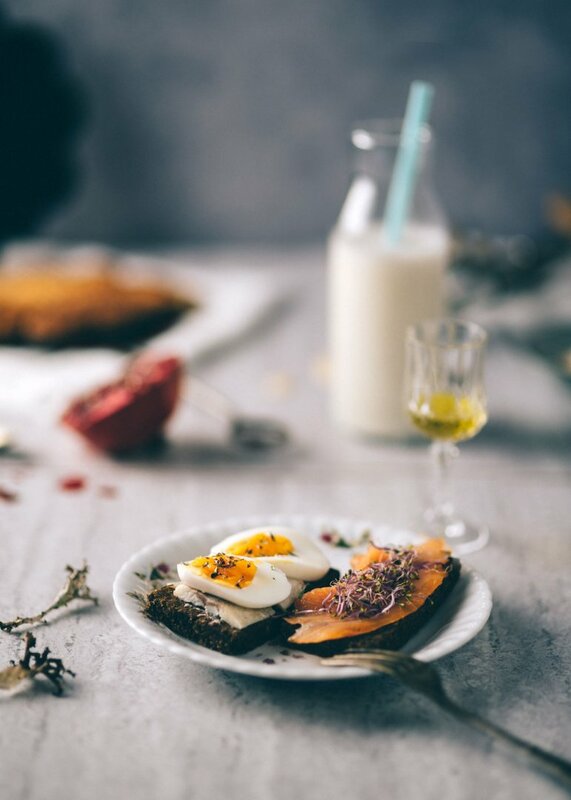 A slice of rúgbrauð is spread with Icelandic salty butter, you then put on a few pieces of spiced herring and some slices of hard-boiled egg. When we first saw it, it looked quite exotic to us, but now we really like it. It’s definitely worth trying. Another version of an Icelandic sandwich is rúgbrauð with smoked salmon or smoked arctic char. The one with arctic char is very popular in the Mývatn lake region in North Iceland. Apart from the lake, this region is famous for its geothermal areas. That means that they have plenty of real volcano bread. 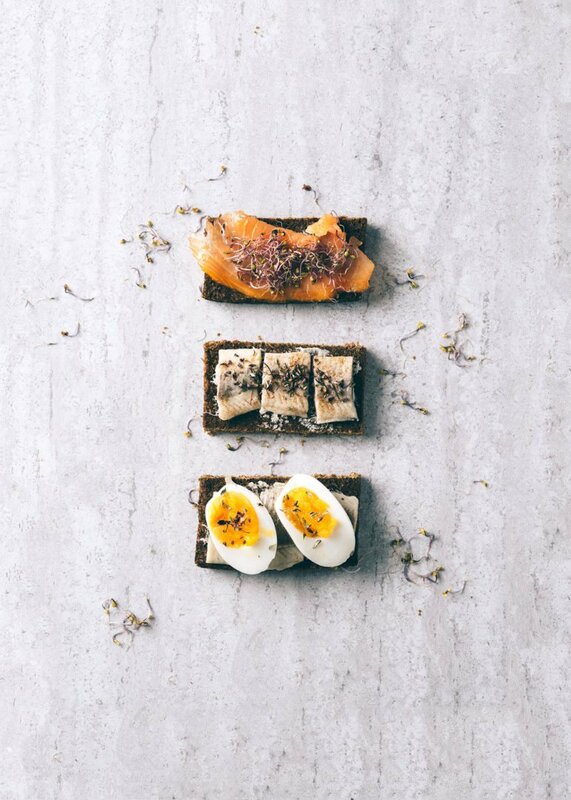 A slice of volcano bread with smoked arctic char is one of our favourite Icelandic breakfast snacks. Preparing everything we’ve mentioned can take some work. But what if you are short on time? Does it mean that you have to give up on a healthy, nutritious breakfast? 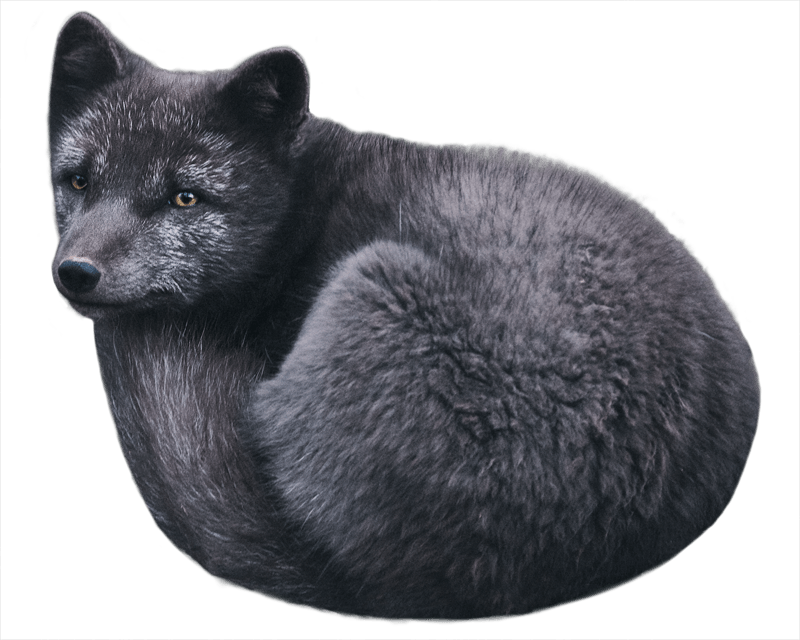 Just imagine – the Icelandic winter is raging outside, it’s freezing cold, dark and windy. Everyone knows how tempting it can be to stay in bed just that little bit longer. Fortunately, we’ve found the perfect solution. You can still have a nutritious breakfast and be ready in a matter of seconds. It will help you to recharge your batteries and give you a burst of energy so you can tackle everything during your busy day. So instead of spending too much time in the kitchen and being late for work, or even worse – not having breakfast at all, you can prepare a Herbalife shake. We are not talking about typical milk or fruit shakes and smoothies. This shake is a real vitamin and nutrition bomb, a perfect meal replacement*. 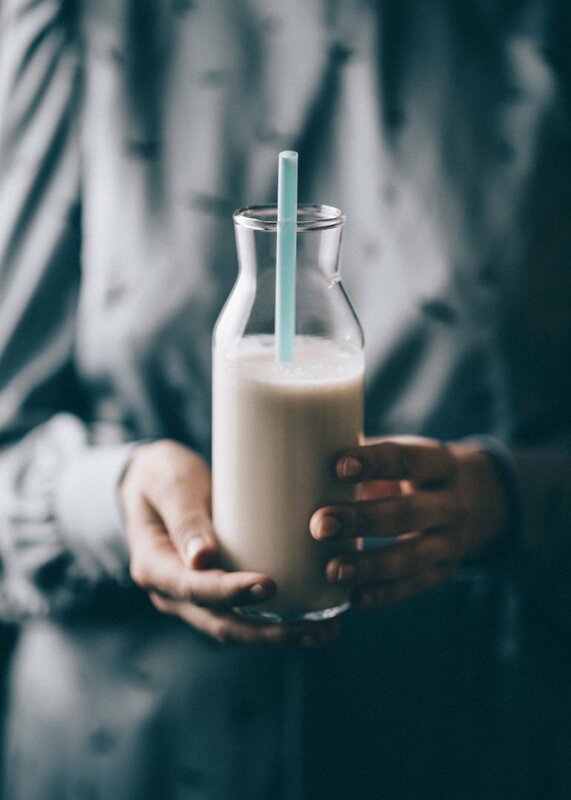 It might look inconspicuous but believe us – one glass of this liquid contains a great dose of healthy power. It contains 22 vitamins and, minerals, and is rich in soya proteins. It provides your body with key nutrients it needs. And it tastes great! Thanks to these shakes we survived the Icelandic fall when the morning darkness and cold didn’t give us enough of a boost to get up quickly and prepare a regular breakfast. 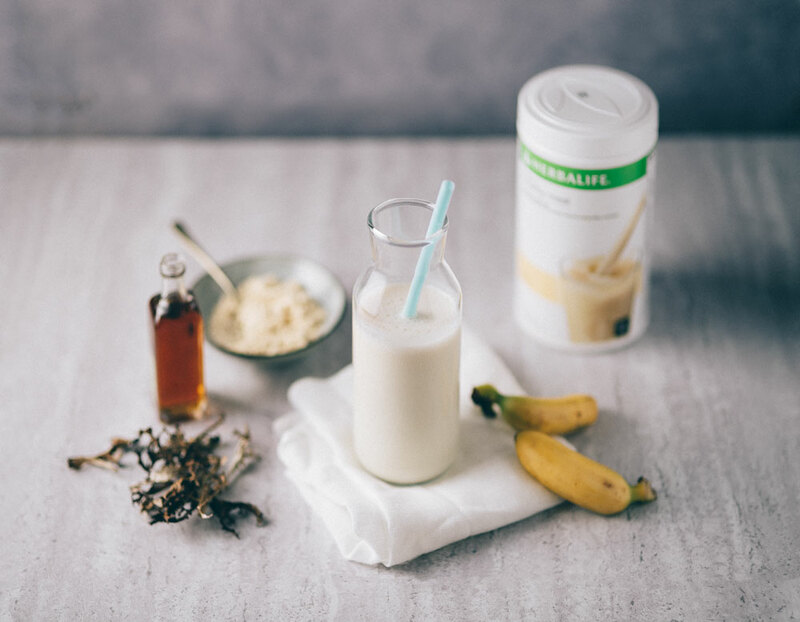 To prepare one portion you only need a glass of milk and two spoons of Herbalife Formula 1; the vanilla flavour is a great base for other ingredients. You can drink it like that or add whatever you wish – fruits, vegetables, herbs. 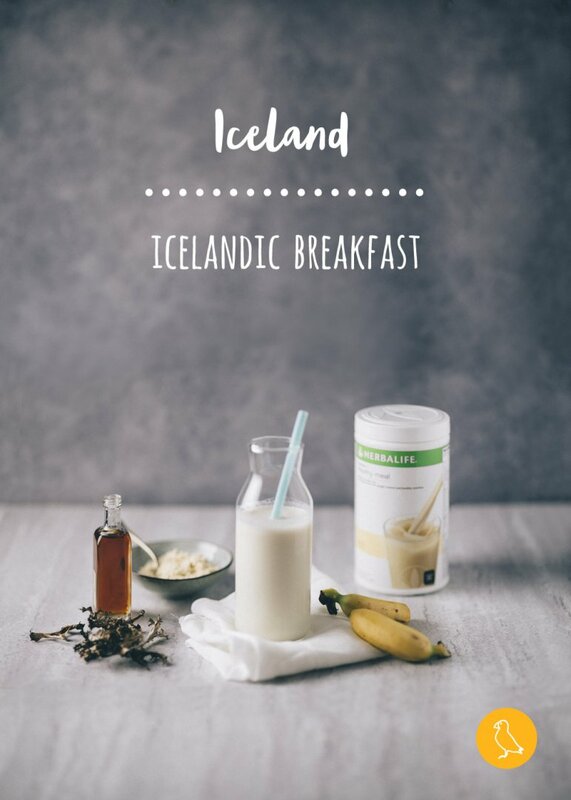 We like to give ours a Viking twist and add bananas with some Icelandic treats such as powdered Icelandic moss and a few drops of birch syrup. Icelandic moss has been a part of the Icelandic diet for years. It boosts the immune system and helps with digestion. Nowadays it’s a little bit forgotten. In the old days, it was mostly eaten boiled. Dried Iceland moss was also added to bread and soups. As it has bactericidal properties, it helped Icelanders to keep their teeth in good condition, when no one had heard about toothpaste. And during periods of famine, f. ex. after the disastrous volcano eruptions, it helped the people of the island to survive. Another ingredient in our Viking shake, Icelandic birch syrup, started to gain its popularity not long ago. It is said to be healthier than maple syrup. It’s full of minerals, antioxidants and healthy carbohydrates. Apart from that, it’s very tasty, so we like to add it to different shakes and desserts. We love banana shakes. That’s why we couldn’t resist adding some to our Viking version. You might find it difficult to believe, but Iceland, which is located just below the Arctic Circle, has its own small banana plantation. In 1941 Icelanders came up with an idea of growing bananas in greenhouses. Unfortunately, they aren’t available on the market. It’s just a kind of experiment and only employees and students of the Agricultural University of Iceland have access to them. Anyway, we’d love to use them in our shake. If one of your New Year’s resolutions is to become healthier and more active, then Herbalife is a great way of starting your day in a delicious and nutritious way. Put all the ingredients in a blender and blend till you get a smooth shake. You can buy powdered Iceland moss in some stores in Iceland and online. You can also prepare the powder yourself from whole dried Iceland moss. Just use a coffee grinder. Iceland moss is slightly bitter, so remember not to add it too much to your shake. Let us know how you like our Viking shake. 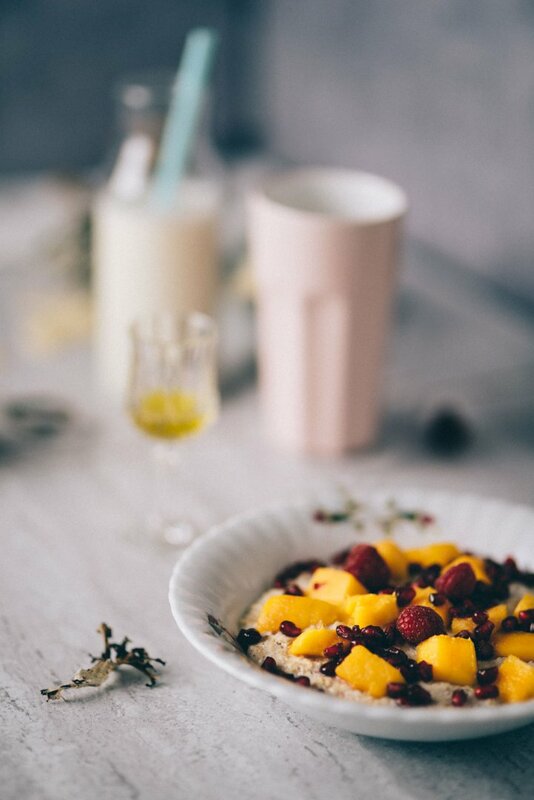 Do you always have time for a healthy regular breakfast? Or are you sometimes guilty of skipping it? It’s very seldom that I’d come across a food travel article that I actually got absorbed into. 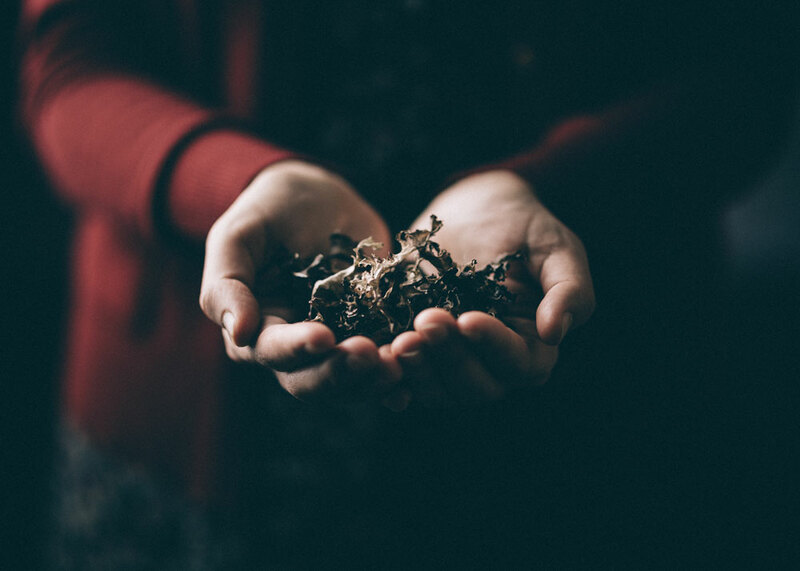 You’ve done a really great job of passing on interesting things about Icelandic ingredients, and how it relates to the way people live, or used to live. Plus, from this I can gather that for a Muslim, it may actually be relatively easy to travel to Iceland, since most of these are halal. Wow..I have taken many virtual tours of Iceland reading different interesting accounts. But this is the first food focused article from Iceland that I am reading. And now I want all the more to visit there. The delicacies look so mouth watering. Particularly hafragrautur. I would love to taste some. That’s interesting! 🙂 Of course, you can get regular bananas in all supermarkets, but we’d love to try the Icelandic ones. Thank you so much! 🙂 You are right – being a vegetarian in Iceland is quite a challenge. Only recently hotel restaurants have started to respect vegetarians and offer something more than just a salad. 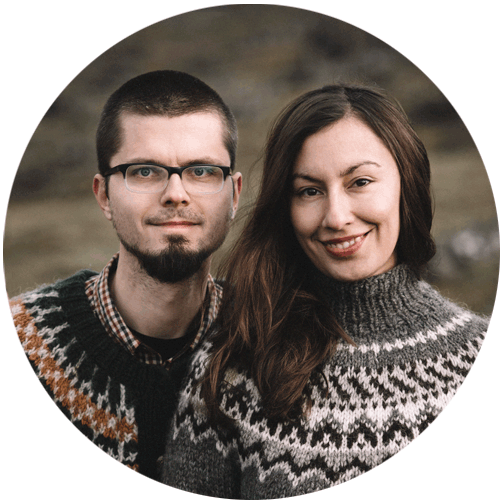 But still, almost all Icelanders can’t imagine their lives without meat (especially lamb). First of all kudos. You take amazing food photos. Second, everyone talks about Iceland’s landscape. This is the first time I am reading about the rich food culture of the country through such amazing food culture. Thanks a lot Anshul! Icelandic landscape is breathtaking – that’s right, it’s like another planet, that’s why everyone is concentrating on it. But there’s a lot more to discover than landscape.